Much was made of a regrettable interview earlier in the week about the Australian equivalent Flu vaccine. Prof. Paul Van Buynder was quoted as saying that “Australia suffered the worst flu season on record because officials chose a cheap vaccine that did not protect the elderly”. Many disagreed. I disagree. Flu vaccines are safe but pretty crap (scientific definition) and adding in a new one licensed for use only in those above 65 years of age, that contains 4X as much active ingredient but is made the same way and as likely to suffer from the same issues described below will – at best – reduce the proportion of crappiness but not overcome it. You can read more about this topic in our latest Conversation article. It’s kinda hard to identify what this new vaccine’s absolute effectiveness is, just that its better than standard dose vaccines. To date, this higher dose vaccine has been trivalent, which seems a step backwards from this season;’ quadrivalent vaccine but perhaps the thinking is that Flu B is not as much of a disease threat among the elderly. But 2017 was more about suboptimal vaccine and diversifying Flu virus. This Flu season (dominated by influenza [Flu] A virus H3N2) moved quickly in Australia this year. Data and expert commentary didn’t keep pace with community and media need. 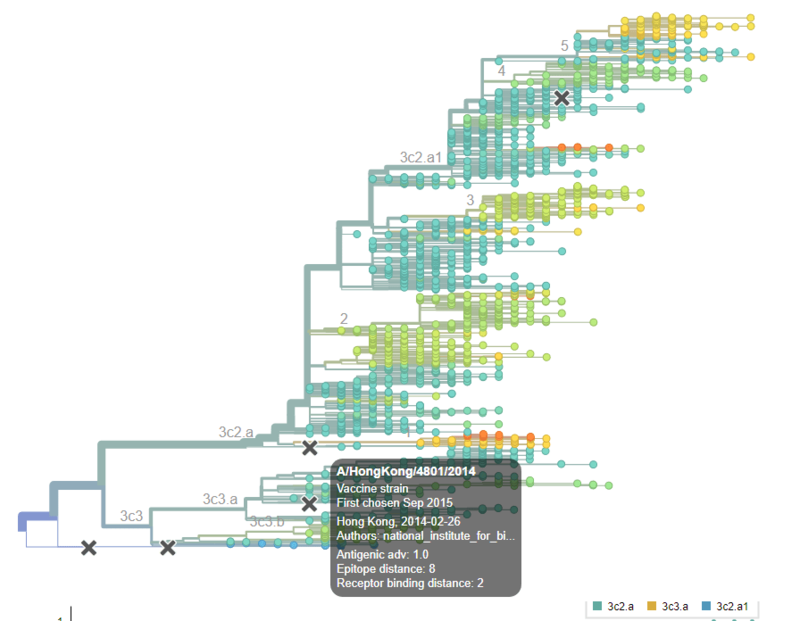 A/H3N2 viruses detected over the past few years  have been mostly classified into a phylogenetic clade (groupings of “leaves” seen on phylogenetic trees like that in Figure 1) called 3C2.a. 3C2.a currently exists as 5 smaller genetically diverse groups called clades. [3,4,5] Lab tests have struggled to nail down the extent of ANY antigenic diversity among these groups because of problems with their agglutination ability. Ferret antibody-containing sera raised to lab grown A/Hong Kong/4801/2014-like H3N2 lab virus inhibited growth of this season’s H3N2s. Ferret antibody-containing sera raised to egg-adapted A/Hong Kong/4801/2014-like H3N2 vaccine virus struggled to inhibit growth of this season’s H3N2s. Only 33% of vaccinated Aussies were effectively protected. Proportions differed between the Flu types and age. So these really highlight how complex the Flu vaccination situation is. It also underlines that we really need to get away from egg-based Flu vaccines and towards something that elicits a more robust, long-lasting and protective immune response ideally bringing in more of the the memory and regulatory capability of the T-Cell arm of our immune system. Ultimately, a vaccine that would only need one or a short course of shots that protect us for years, or even life, as do other vaccines. In the meantime, Australia is likely to get a new vaccine (the U.S. have had it since 2009, Canada since last year) added to its armamentarium to help reduce illness and death among the Flu infected elderly.